"Finally some decent religious schooling in the children's book market. [...] Read and contemplate, both young and old." Nina Lekander in Expressen (Sweden's largest tabloid). "I think that this is an important book to read, whether you believe in God or not." "The book is extremely suitable to put into the hands of any young person who is grappling with philosophical and religious questions. [...] An interesting and consequent book that takes its readers seriously and points out that everyone has to take reponsibility for their own life. As far as I know, nothing similar exists for teenagers before." "Even when it comes to other gods and religious motives, Vanja has toned down her somewhat twisted style and awkward sens of humor. But just a little." Johanna Rovira in the magazine Kollega. "In this book all questions are put to the test, exactly as simple as they really are. With a humble tone, the author removes our blinders and instills courage to think for ourselves." "Hanna" at the internet book store Ad Libris (where the book has been awarded 5 stars by 7 reviewers). "I can barely wait to give this book as a confirmation or first communion present to someone." Dan Larhammar - Former chariperson in the Swedish sceptics society Vetenskap och Folkbildning. "Short, simple arguments that make it impossible to stay a believer after reading. Ingenious illustrations that make you laugh. I warmly recoomend this book to anyone with an open mind." "Danne" at the internet book store Ad Libris. "Even if this book is aimed at a younger audience, I think it can serve as an eye opener to many who are religious only by convention." Familjen Stegmarks blogg. "A book about atheism for children is totally ok if the children are also taught about other prespectives." Orsakverkan. "Of course children should think about this as much as about Jesus and the crucifiction." Sandras blogg. Adults are no the only ones capable of questioning religious truths. On the contrary, many adolescents find themselves tackling these difficult and complex issues. In spite of this, books summarizing a secular view of life for children and young adults are scarce and hard to find. This is what Patrik Lindenfors aims to rectify with his book Gud finns nog inte (God Probably Doesn't Exist). To doubt is to think for oneself. Patrik Lindenfors presents a world without myths and supernatural beings in this contemplative and open-minded book. 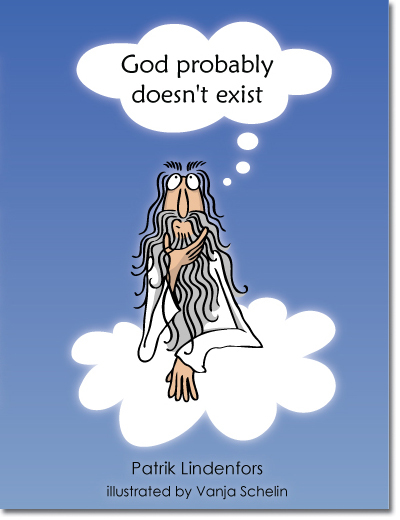 “God Probably Doesn’t Exist” suits anyone who has ever asked themselves whether or not there is a God. The book is an easy-to-read introduction of a secular view of life, in which each argument for and against the existence of supernatural beings is discussed on a separate page. The debate about religion and religion’s influence on society is currently raging in the U.S. Books about atheism and religion have topped many best-seller lists. This debate is now becoming more prominent also elsewhere. Patrik Lindenfors is the father of three children and works as an evolutionary biologist at Stockholm University. He has a keen interest in different cultures and religions, and has therefore travelled extensively and has also lived in such diverse countries as Sweden, Tanzania, USA, India, and most recently Kenya. “God Probably Doesn’t Exist” is his first contribution to the discussion about religion and religion’s role in society.